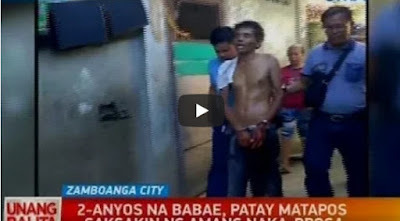 A drug-addict father was arrested in Barangay Kasanyangan, Zamboanga City last Sunday, April 8 for killing his 2-year old daughter, according to a news report at “Unang Balita” via GMA 7’s morning show “Unang Hirit.” On the other hand, the Commission on Human Rights (CHR) released their comment on the arrest. Watch news video below. Based on the report, the father was identified as Gapor Alkasaya, 40, while his daughter is Ayana Alkasaya, whom he stabbed in the neck on Sunday, at around 2 pm inside their home at Hanapi Drive, in the said barangay. The victim died on the spot, while the suspect was reportedly high on drugs when he killed his daughter, and was armed with 2 bolos. The addict father ran to his sister’s house as he tried to escape from the police, who immediately responded. The police was forced to shot him as he resisted the arrest and fought back (nanlaban) using his 2 bolos. He was brought to the nearest hospital, where he survived the gunshot wounds. The suspect is now in jail and is facing a parricide case. Meanwhile, CHR Chairperson Chito Gascon praised the police for their immediate response that led to the arrest of the addict father. According to him, the availability of the authorities is very important, so that the suspects will not escape. However, he questioned why they have to shoot the suspect, considering that he has no gun. “Nalulungkot na mayroon pa ring karumal-dumal na krimen na gaya nito sa kabila ng sinasabi nilang mahigpit na daw ang programa ng gobyerno laban sa droga. Ganunpaman, natutuwa ako na nahuli agad ang suspect. Pero ang tanong, kailangan ba talaga siyang barilin? Paano kung napatay siya?” Chairperson Gascon told reporters.